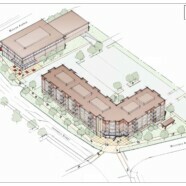 Waterloo to get new 70-unit condominium project downtown | Vandewalle & Associates, Inc.
WATERLOO, IA. A development agreement and land conveyance for a $9 million, 70-unit downtown condominium complex in downtown Waterloo was approved by the City Council Monday night. This will be the first multi-unit housing project of its kind in downtown Waterloo, representing a real shift to grow urban live-work-recreate lifestyles and draw residents into the central city. The new project will be located at the former Grand Hotel site, at U.S. Highways 63 and 218 between the downtown Cedar Valley TechWorks and Cedar Valley SportsPlex.